Title: ENGLISH LANGUAGE IN THE ROMANIAN ECONOMIC FIELD AND BUSINESS ENVIRONMENT: A NECESSITY OR A FAD? Abstract: The purpose of the present article is to analyse the influence of anglicisms in the Romanian economic field and business environment. English influence in Romanian, very pronounced in the current European languages, is accomplished both by taking massive lexical elements and by assigning meanings of English borrowings to Romanian words. The emergence of English words’ borrowings in our country is due to the current socio-political conditions and widening of economic-financial relations with the Western world, the English words being used by specialists for communication and information in all fields, as well as speakers who tend to practice English as the international language of communication. Major transformations in the international social-economic organization imposed the development of modern disciplines: finance, statistics, management, marketing, business administration, whose languages are subordinated to the economic field. The research is intended to provide examples of English borrowings used in the economic language. English terms, specialized or not, especially in the form of a borrowing, penetrate directly in all economic subdomains, by virtue of an interference trend (manifested internationally) concerning terminologies and the relations of specialized vocabulary with the usual one. One way of English terms entering the Romanian language is the specialised texts. The article also points out terminology concerning conditions of delivery and international business transactions. The written or spoken media contributes greatly to the spread of anglicisms that inform the public on various issues and developments in the social, political, cultural and economic aspects, nationally and internationally, having an important role in English vocabulary’ modernization by borrowing from English. The conclusion of the article is that with all the difficulties of adapting to the linguistic system of the Romanian language, the English borrowings continue to get massive and rapid in our current language, speeding the process of vocabulary enrichment, also resulting in major changes at other levels of the system. Abstract: As is generally defined, eponymy, one of the word-formation processes refers to the derivation of a name of a city, country, era, institution, or other place or thing from that of a person such as sandwich, wellington, mackintosh or cardigan. Eponymy can be classified in several ways, some refer to foods (Pizza Margaritha), diseases (Alzheimer disease), places (Washington), scientific laws (Archimedes’s principle) and sport terms (Axel jump), whereas others indicate trademarks, brand names (aspirin), prizes, awards (Nobel Prize), inventions (Rubic’s Cube), ideologies (Darwinism), colleges, universities (Stanford University) and companies (Ford). The present paper discusses eponyms which denote companies based on the name of their founder(s) (e.g. Porsche, Siemens, Gucci, Campari, Cadbury, McDonald’s and Walt Disney, etc.) by revealing what kind of a metonymic relationship is manifested in them. Cognitive linguists, such as Lakoff and Johnson (1980), Radden and Kövecses (1999) and Kövecses (2002) state that metonymy is essentially a conceptual phenomenon, in which one conceptual entity, the vehicle, provides mental access to another conceptual entity, the target, within the same idealized cognitive model. In fact, metonymy is part of our everyday way of thinking, and is grounded in experience. Common metonymies include PRODUCER FOR PRODUCT (Pass me the Shakespeare on the top shelf. ), PLACE FOR EVENT (Iraq nearly cost Tony Blair the premiership), PLACE FOR INSTITUTION (Downing Street refused comment. ), PART FOR THE WHOLE (She’s not just a pretty face. ), WHOLE FOR THE PART (England beat Australia in the 2003 Rugby World Cup final.) and EFFECT FOR CAUSE (He has a long face.). Following the cognitive approach to metonyms, I tentatively suggest that the metonymy PRODUCER FOR THE PRODUCT can be observed in the case of car makes, products of famous fashion houses, cosmetics and drinks as is illustrated by examples like He’s bought a Ferrari. I ate a McDonald or We watched Walt Disney all day. I also point out that the producer and the product belong to the idealized cognitive model of PRODUCTION, in which the vehicle is the company producing the product and the target is the product produced by it. 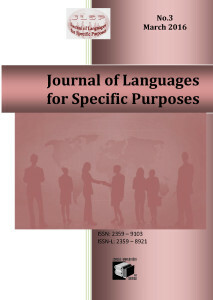 Abstract: This paper will outline an instructional approach that proposes a Complexity, Accuracy, Fluency (CAF) paradigm as a means of providing learners with the CAF-based communication consciousness and CAF-oriented manipulative skills that are increasingly important in language use in Language for Specific Purposes. Given the complex combinations of communicative tasks, communicative formats and communicative circumstances that accompany the wide-ranging and various contexts of contemporary professional communication, communicative competence demands a combinative consciousness and informed application of Complexity, Accuracy and Fluency as a communication paradigm. Viewed as a combination of its three components, a CAF paradigm constitutes a fundamental ‘information, language and communication’ triad that can guide professional language use in any communicative circumstance. Viewed as a communicative skill set, the CAF triad implies the capability to adjust specific elements and aspects of information, language and communication as needed for a communicative task, whether in oral or print communication and regardless of task category. Adjusting complexity in this context refers to both content and language complexity. Adjusting accuracy refers to the conventions that dictate appropriate or acceptable language in a given context. Finally, adjusting fluency refers to a sense of communicative fluency, that which yields either smooth and persuasive language as in a native-speaker normative view or explicit and clearly explanatory language as necessary in some communicative encounters. The need to manipulate these three components depends on circumstance variables such as objective, available time, audience characteristics and the degree of detail desired. This paper will outline this combinative CAF notion as background to a materials development project being undertaken in a Japanese university, introducing the specifics of an Extended Reading Aloud format that involves learners in managing the content and language complexity, manipulating various language registers while focusing on accuracy, and proceduralizing communicative fluency in different communicative genres. While empirical testing of the interactions of Complexity, Accuracy and Fluency in a testing paradigm have yielded contentious and contradictory outcomes, the qualitative research findings presented in this paper contribute to an instructional application of CAF, a view that maximizes the potential of CAF in educational and communicative contexts. Although undertaken in a Japanese university English educational setting, the generalizations underlying the instructional materials are applicable to most ESL/EFL and LSP/ESP educational settings. Abstract: The immense role of advertising in modern world can hardly be limited only to persuading the addressee to buy a certain product. Its functions extend far beyond informing, influencing or stimulating and reach the level of cognition and conceptualization. The fact is advertising manipulates language to achieve its ends, and the strategies at its disposal are manifold. Moreover, it creates the substitute reality, which interferes with the recipient’s world view, thus realizing its manipulative potential. Manipulation as a specific form of hidden psychological persuasion involves two participants (a manipulator and a manipulated) and is aimed at psychological categories of anchors, targets, and social stereotypes. When extrapolated to the realm of cognitive linguistics, the above mentioned notions correspond to those of the frame of the addresser, the frame of the addressee and the basic concepts of advertising discourse. The purpose of this article is to view advertising discourse in terms of both pragmatics and cognitive linguistics in order to study the nature of manipulation exerted in it, to reveal the involved strategies, to single out the key concepts, which serve as the constituents of the world view, being simultaneously its reflectors and its moulders. In order to fulfil the objectives the wide range of linguistic methods has been employed. The methods of communicative approach in linguistics have been applied to single out the constituents of advertising as a complex speech macroact with the persuasive microact being the only obligatory one. The findings of linguistic psychology substantiate the manipulative nature of advertising. The functional analysis serves as the basis for revealing its communicative strategies. The application of the tools of cognitive linguistics enables the detection of six key concepts of advertising discourse and their conceptual markers.The modern American magazine advertising discourse within the period from 2009 to 2014 has been selected as the material for the research, with 2000 samples of advertising discourse being analyzed. The main conclusion to be drawn is that advertising contributes to moulding the addressee’s world view, thus affecting the way the recipient perceives the reality and shaping his/her values.To put it another way, advertising discourse causes shifts in human cognition and imposes on its recipients new ideals, standards and moral principles. Keywords: advertising discourse; manipulation; world view; concept; conceptual markers. Abstract: This paper presents a qualitative case study of a virtual service learning project that connected high school students in rural Michigan with communities and a non-profit developmental organization in Honduras. First, students created individual research presentations over Honduran history, current events, economics, and poverty. Second, students were introduced to the concept of service learning, the educational philosophy of Paulo Freire, and Muhammed Yunus’s micro-credit economic process through readings in the target language. Third, using collaborative and Internet-based technology such as Google Docs, students were able to successfully engage in a meaningful service learning opportunity to translate training documents for a micro-loan organization despite the lack of an accessible, locally based Spanish speaking community. Finally, students reflected on their experience with the service learning project. Additionally, the authors discuss the connection between the student translation project to ACTFL’s World-Readiness Standards for Language Learning and the formation of a 21stcentury skill set. While proximity and access to such physical communities remains an obstacle for many foreign language instructors seeking to integrate civic engagement, this case study presents one possible solution that pushes the boundaries of the very concepts of community and service learning. Abstract: The following study is meant to be an extension of and completion to a former research paper entitled “The Role of Foreign Language Teachers in Developing Students’ Intercultural Communication Skills” concluding that students of the University of Oradea, Romania, generally lack intercultural sensitivity and it falls to a great extent to foreign language teachers to change this state of affairs. When the former study came up with proposals for methods of enhancing students’ cultural awareness (see simulation games on cultural differences like Barnga, BaFá BaFá, Randömia Balloon Factory and others), the present study focuses on an international comparison, though limited to only three academic institutions in three countries, regarding Eastern and Central European students’ intercultural sensitivity. The initial idea was to see to what extent students of the University of Oradea, Romania, studying Economics, Medicine and Law dispose of intercultural skills. For this reason a Likert-type scale questionnaire was applied to more than 200 students of the above mentioned faculties. The survey was extended in the second round in Oradea, Romania, also to the Faculty of Environmental Protection and that of Electrical Engineering and Information Technology, respectively to an international level asking students of the University of Debrecen, Hungary and the University of Maribor, Slovenia, the same questions. Although we are aware of the limitations of present study, – only three institutions included in the research, having in Debrecen and Maribor less respondents than in Oradea and only from some fields of study, Slovenian students not getting a Slovenian version of the questionnaire, which may have influenced their level of understanding issues, responses not always being consistent – its results have still an informative value. They confirm the author’s initial hypothesis that in spite of the extended international relations and travel opportunities Romanian students are not really aware of cultural diversity and its overwhelming impact upon people’s behaviour, reactions and way of thinking. As to our surprise there are no better results with the other two nations either, specific measures are to be taken in this respect including not only valuable contribution of foreign language teachers – as proposed in the former study – but also curriculum change by incorporating some form of intercultural training, too. Given that obtaining a language exam certificate is a pre-requisite of graduation, the role of academic education in providing students with the required knowledge base and successfully preparing them for language exams has become more important. The structure and content of modern business language exams reflect the need to meet the demands of the labour market. There has been a definite shift from grammar-oriented, translation-based tasks towards a more communicative approach which involves testing reading comprehension, writing skills and performance in situational role plays. However, while students generally cope well with understanding written business texts, many of them frequently fail in oral communication. Consequently, the question arises of whether it is possible to bridge the obvious gap between reading and speaking skills. 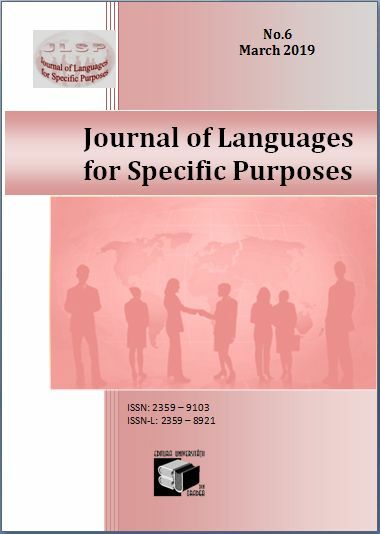 This paper aims to give a possible example of how a descriptive text can be adapted to prepare students for the situational role play tasks in business language exams at the Faculty of Economics and Business Administration, University of Debrecen. Abstract: We offer a reflection starting from field observation: the practice of teaching scientific English in a French scientific university (University Paul Sabatier-UPS-Toulouse) because it is our research and teaching domain. Let us not forget that English has become the universal language of science because of American globalization. At UPS, English teachers essentially design their courses of scientific English from constraints, training and experience. These difficulties are reinforced by the low recognition of their courses. These findings are part of the broader issue of LANSAD (Languages for Other Specialized Disciplines). Yet these teachers have been trained in the traditional areas of English (literature, civilization, language). Consequently the issue of training in this context arises. Because it is essential to be legitimate, credible and hence recognized in this domain. The problem lies in the very low number of masters in LANSAD and LSP/ASP. This is due to a few number of research work in the domain. We believe that recognition goes through research which must be credible by meeting certain external validity criteria and even more so in our scientific context. It is therefore necessary to undertake an epistemological approach of the LSP/ASP in their uses, by integrating the specialty that is missing in LSP studies (Van der Yeught, 2014) and the didactic dimension because LSP is a research and teaching subject, aiming at the competence in the specialty and not in their sole function of production of specialized knowledge. Because we believe that LSP can contribute to the professionalization of university courses (Van der Yeught, 2014). We would like to make our contribution to the epistemology of LSP/ASP with our research work in English for science that also covers teacher training in LANSAD in scientific university contexts. We set some milestones, beginning with the description of science in its relation to the English language-culture through an interdisciplinary approach: the history of science, sociology of science, philosophy of science. Finally, we offer food for thought on teacher training in LANSAD. Abstract: The aim of this study is to analyze the components that the foreign language students of German and English have to develop in order to improve the ability of pragmatic competence. This article presents a description of the first phase of our ongoing research project entitled “The role of explicit instruction in developing pragmatic competence in learning English and German as a foreign language” (”Die Rolle der expliziten Anweisung in der Entwicklung pragmatischer Kompetenz im Englischen und im Deutschen als Fremdsprache”) at the University “Goce Delcev” in Štip in the Republic of Macedonia, as well as it gives a short review about the development of pragmatic abilities of German and English language students. We first define the pragmatic ability, then we discuss the tools that we have used for the collection of data, as well as the analysis method. Finally, we give an overview about further research of the project. 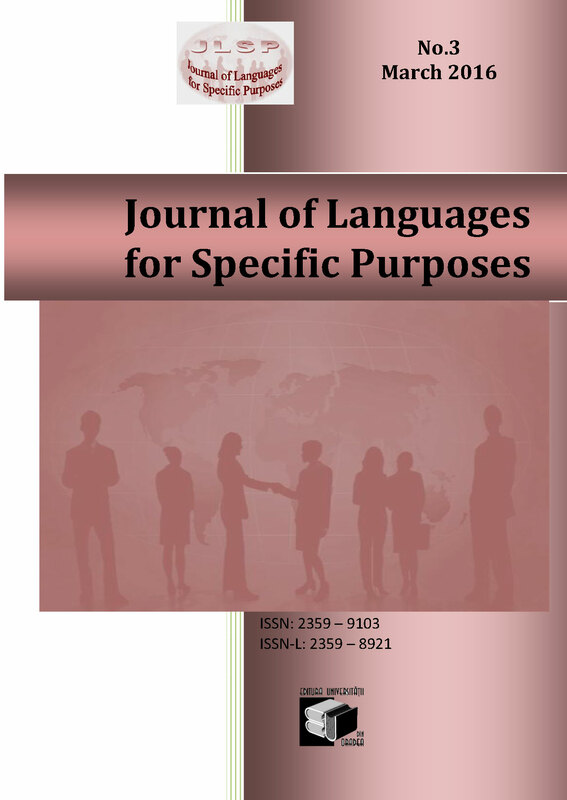 Abstract: The article is devoted to the problem of comparative analysis of vowel and consonant realization in contemporary German, English, Dutch, Ukrainian, Russian and Polish. This study also discusses the difference between comparative and contrastive methods, the procedure of the phonetic experiment, the tasks and hypotheses for comparative auditory and instrumental analysis of distinctive features of vowels and consonants of Germanic and Slavic languages. The organization of sampling and requirements for statistical data processing is described in the practical part of this study. In general, the realizations of 2313 German, English, Dutch, Ukrainian, Russian and Polish vowel and consonant phonemes are described separately in strong and weak positions. It is approved that Germanic consonants possess correlation of opposition both “density/ weakness” and “voiceless/ voiced”, while Slavic consonants are opposed only as “voiceless/ voiced”. The compulsory opposition “voiceless/ voiced” constitute stop consonants is observed in all studied languages although resonant, approximant, glottal and pharyngeal phonemes do not show it. The required devoicing of voiced consonants at the end of the word is characteristic only for German, Dutch and Russian consonants. Ukrainian and Polish consonants are marked with an optionality of this phonetic phenomenon, but in English it does not exist. The position of neutralization of the distinguishing feature “vocal cords activity” is the word end for German, Dutch, Russian and Polish consonants. A partial progressive assimilation of voiceless consonants is typical for German, English, Dutch, Russian, Polish, but in Ukrainian and Russian it is absent. The regressive assimilation of voiceless consonants is mandatory for Russian and Polish. For Ukrainian it is optional and positionally predetermined, and in Germanic languages it is not observed. A partial lenization of voiceless consonants in front of voiced consonants is peculiar to German, Russian and Polish. The most common change phenomenon is on the juncture of morphemes and phonetic words. In addition, the modification of Slavic consonants is often motivated by different morphological factors. Acest articol a fost postat Wednesday, March 23rd, 2016 la %I:%M %p	in categoriile archive. Puteti urmari comentariile aduse acestui articol prin RSS 2.0 feed. Responses are currently closed, but you can trackback from your own site.